What is the most important thing to you on internet? Absolute Data Security & Privacy! Commercial data in particular. Unfortunately, There is nothing can be trust on internet, including third party services. So, If you want data security, You have to hold 100% data ownership. 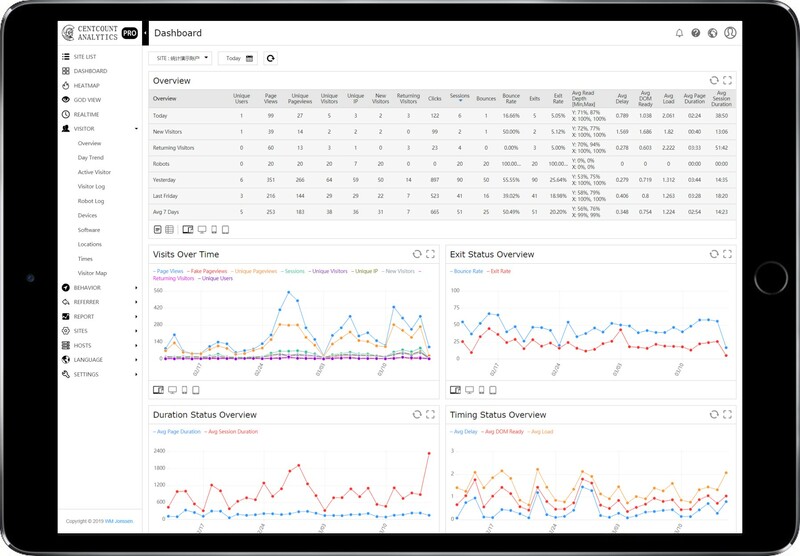 Centcount Analytics is a free open-source web analytics software. It can be deployed easily on your own server, 100% data ownership. 1. Provides up to 37 fixed reports of various dimensions, real-time visitor data, and advanced analysis tools such as heatmap, mouse tracking and custom report. 2. The unique page heartbeat technology allows you to accurately record the single page duration time. We also do the functions that others do not do, only for the needs of users. 3. In-depth tracking of visitor reading behavior, whether it is page reading depth or depth of visit. Let you understand the page experience and visitor's reading habits. 4. The powerful Fire-Eye technology, let you know a lot of cheating network traffic. We have our own standard of data identification. Whether it is spiders, robots, or fake traffic will be detected easily. 5. The technology based on global listening has achieved tools such as heatmap. But the pursuit of technology should not exceed the moral bottom line. We will continue to stick to the bottom line and never do evil. A new & direct way to show the visitor's clicks on your page. Thanks to the advanced page element level positioning technology, the Centcount Analytics heatmap perfectly supports the adaptive page, combined with rich data filtering functions, to present a different data view as your wish. Centcount Analytics records every visitor's mouse tracks, Analyzes those actions to get visitor's real thought & dig out hidden page errors. In some cases, heatmap is not enough to explain everything. By using God View to examine each visitor's browsing behavior. Through fetching visitor behavior data to modify page to more conform to people's browsing habits, find out unknown page errors, insight into visitor's intentions. Play Data In Any Possible Ways. Return data with grouped and sorted. Get the data what you want without any limitation, because all of the data is yours. The programs are all written with native programming language and do not use any third-party libraries or frameworks. The procedural programming style ensures program execution efficiency while ensuring that every line of code is understandable and controllable. The reason for not using third-party libraries and frameworks is that we can't understand them thoroughly, and how to ensure security for things you don't understand. Therefore, we advocate to reinvent the wheel, and this is the only way to have independent intellectual property rights, so that there is real security. Centcount Analytics can run on all devices, grab any device around you can log in to the Centcount Analytics, Superior design allows you to easily view all the website data, And you don't have to download and install any APP, extremely convenient. Enjoy the portable web analytics tools now!